Matthew 26 [47.] While he was still speaking, behold, Judas, one of the twelve, came, and with him a great multitude with swords and clubs, from the chief priest and elders of the people. Now he who betrayed him gave them a sign, saying, “Whoever I kiss, he is the one. Seize him.” Immediately he came to Jesus, and said, “Hail, Rabbi!” and kissed him. Matthew 26 [55.] 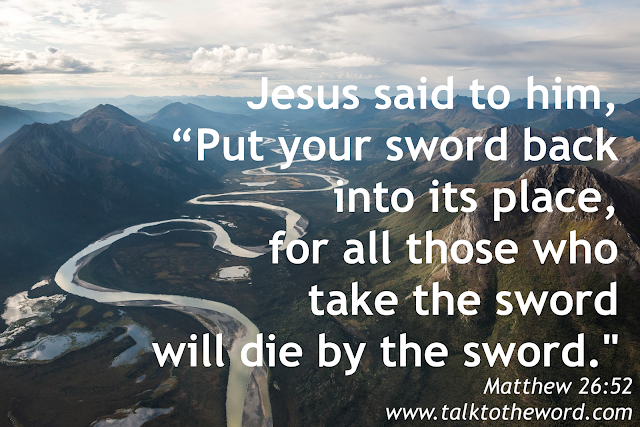 In that hour Jesus said to the multitudes, “Have you come out as against a robber with swords and clubs to seize me? I sat daily in the temple teaching, and you didn’t arrest me. But all this has happened, that the Scriptures of the prophets might be fulfilled.” Then all the disciples left him, and fled.